Life is so long and we cannot know who we are tomorrow. The faces are patchy with streaks of colours. Some are barely visible, illuminated in shades of lacquer. Whether it‘s a self-portrait of the artist or the face of a chance encounter, we can feel it deeply across the distance between the painting and us. Eliminating rules of form and mastering the technique of his material, Vu Duc Trung has made his feelings come to life in this series of lacquer portraits. We still see in his paintings the images of flickering water and cool forests that are recurrent subjects throughout the artist’s work. Today, the artist creates portraits that come to us as the optical illusions of life that is blurred by time and which must melt away into emptiness and decay. Talk less do more; Trung’s paintings and vision develop over time. Unexpected factors in his paintings seem to fade only to be replaced by new dimensions of his art. 5 years, 10 years, 20 years…. That process is suggestive of the constant flow of water, the seasons of the forest, the ups and downs of life, and then one hundred years later…. 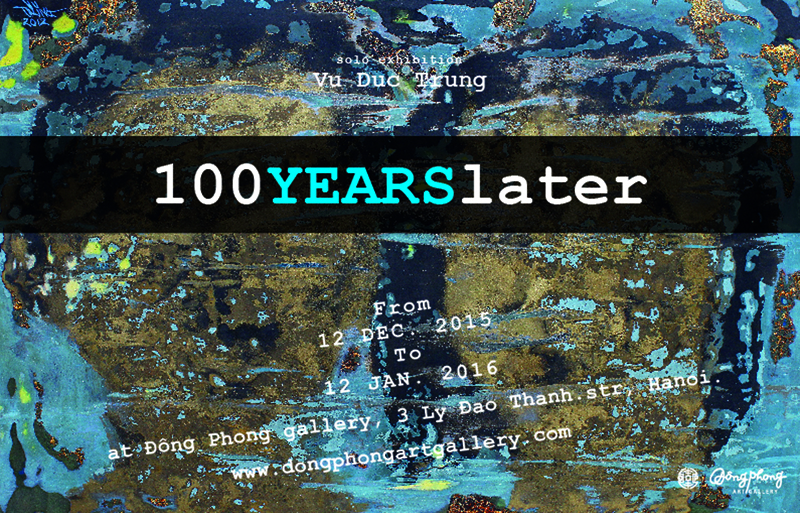 Come to the show “100 years later” by the artist Vu Duc Trung to contemplate and feel the freshness and purity of lacquer paintings. The exhibition will take place at Dong Phong Art Gallery, #3 Ly Dao Thanh, Hanoi, from 12 December 2015 to 12 January 2016.